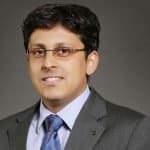 Salil Dani is a member of the Global Sourcing team and assists clients on topics related to Location Optimization, Benchmarking, peer intelligence, and sourcing model initiatives. Salil’s responsibilities include leading Everest Group’s Market Vista and Advanced Locations Tool offerings. To read more, please see Salil’s bio. Over the years, Mexico has become an attractive nearshore delivery location for U.S. enterprises and service providers. But two significant potential challenges may impact its popularity. To boost economic ties, Mexico, Canada, and the United States entered the North American Free Trade Agreement (NAFTA) in 1993. However, NAFTA critics argue that it has resulted in job losses and suppressed wages in the U.S., and encouraged illegal migration of workers from Mexico into the U.S. The Trump administration is considering withdrawing the U.S. from NAFTA due to ‘protectionist’ measures, i.e., those that are in the interest of U.S. domestic market. To further promote and create jobs in the U.S., President Trump has proposed incentivizing companies to make goods domestically by adding a tax – an outsourcing, or border adjustment tax (BAT) – on companies that import goods and services from other countries. He has floated the idea of 20-30 percent BAT on imports. While the actual impact of impending renegotiations on NAFTA and potential implementation of the BAT on Mexico as a nearshore service delivery location is yet to be seen, Everest Group conducted research to determine the likely short-term effect of these developments on the IT-BP industry in Mexico. Following are snapshot findings from our study. Further, while there are multiple alternative locations in Latin America available to U.S. enterprises, very few offer a significantly better cost-talent proposition than Mexico. Thus, even in the likely scenario of NAFTA revocation, Mexico is not likely to lose its sheen as an attractive nearshore location for IT-BP service delivery for U.S.-based organizations. Although there are no favorable indicators in the short-term, there have been no knee-jerk reactions from firms leveraging Mexico for service delivery. We believe the country’s medium- to long-term outlook continues to remain positive for IT-BP services delivery. While it is universally acknowledged that a stricter visa regime will negatively impact most service providers’ onshore margins, particularly the offshore-centric providers that follow the “landed” resource model (i.e., a delivery model that hires resources from offshore centers to work in the U.S.,) it is important to examine the true nature of this impact. The exhibit below indicates the possible impact on onshore margins under various visa reform scenarios. Even in a situation where the visa reforms do not translate into full-fledged regulation (the most ideal scenario for Indian-heritage service providers) we expect far greater scrutiny of H1-B visa applications, leading to fewer visa grants. Even in this scenario, we expect more onshore hiring by IT service providers to meet their talent requirements, leading to reduction of service provider margins by 2-4 percentage points. The probability of the above happening has become more dubious, given recent developments, and it is highly likely that visas will be granted based on either skills/merit or minimum wage requirements of US$130,000. In either case, service providers will need to hire a much higher share of local resources. This further complicates the situation for Indian-heritage providers, as they have a smaller foothold in the U.S. talent market than do the global providers. Whether Indian-heritage or global, hiring landed resources at some/all levels of the delivery pyramid at the minimum salary levels of US$130,000 could drop service provider margins by as much as 14-16 percentage points, resulting in negative returns on onshore deals, at least in the short-term. While none of the scenarios paint a rosy picture for service providers, the impending visa reforms may act as a catalyst for them to develop more automation solutions and front-end technology products and restructure their talent hiring and value proposition. Interestingly, while onshore resources will increase in U.S.-based contracts, the overall portfolio-level offshore ratios may also marginally increase with providers pushing the offshoring lever to protect their overall margins. Everest Group has simulated the potential impact on onshore margins using key input variables around existing cost structures, rate cards, staffing pyramid, and onshore-offshore resource mix. 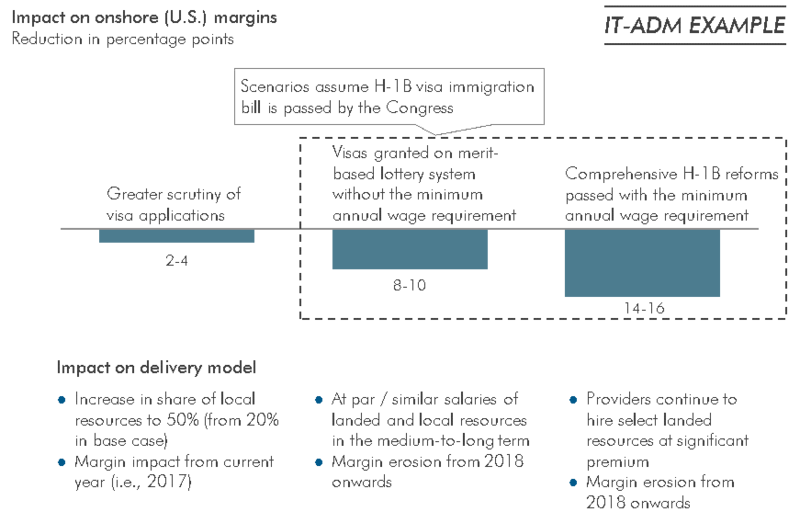 Please see our viewpoint on the above topic: “Impact of Changes to H-1B Visa Program on Service Provider Margins” for more details. The topic of productivity differences in contact center locations has always been of interest to enterprises, GICs, and service providers. In the last few months, there has been a significant increase in firms’ interest in leveraging an integrated global delivery model across offshore, nearshore, and onshore locations for their contact center needs. In addition, the looming prospect of higher barriers to offshoring/nearshoring is also shifting focus from a labor arbitrage model to one of productivity gains. Against this backdrop, Everest Group conducted targeted research to assess relative differences in contact center productivity across locations, using agent efficiency as a proxy for productivity. Our research uncovered an interesting finding: while there are location-specific variations, agent productivity does not consistently vary by location category (i.e., onshore versus offshore/nearshore). While agent productivity is influenced by multiple factors, only two – average call handling time and agent utilization – are largely location-dependent. Even after normalizing for other factors such as nature of business, work mix, and scale of operations, there is no evidence to suggest that productivity is higher in onshore locations than in offshore/nearshore locations. The reason that productivity variations are not location specific is that both average call handling time and agent utilization are, in turn, impacted by drivers that largely do not vary consistently across location category. For example, both scheduling efficiency and training effectiveness are influenced more by center-specific policies and work environment than location category. Thus, it’s the interplay of these and multiple other drivers, which often negate and counterbalance each other, that are the key contributors to productivity variations, not the locations themselves. Managing attrition has always been a priority for business leaders in global services, and its importance continues to increase over time. Given rising competitive intensity for talent, especially in mature markets, attrition continues to consume significant mindshare of senior executives and HR managers. The key challenge has always been to quantify the actual impact of attrition on their companies’ operations. Everest Group has developed a quantitative framework to identify the financial impact of attrition, by evaluating both costs and benefits (see Exhibit 1). Attrition impacts two key parameters of business – direct attrition-related costs (e.g., expenses on recruitment, employee onboarding/training, and employee pay-outs) and productivity loss/revenue leakage. Although the benefits associated with attrition are often not fully understood, mature firms have been able to achieve lower employee costs per FTE by adopting strategic and policy-level levers. Based on this framework, we define “good” attrition as the average annual employee turnover rate at which an organization has a net financial gain for its operations. Everest Group’s analysis indicates a good attrition rate in an India-based English language contact center is 25-30 percent annually (see Exhibit 2). Firms with a lower or higher turnover rate incur net costs. Good attrition rates are influenced by both market- and company-specific factors, and vary by function and location. For instance, the Philippines has an attrition rate range similar to India’s for contact center services, but a much lower one for IT services. Operations in Eastern Europe and Latin America usually have a much lower rate of good attrition compared to Asia across all functions. It is noteworthy that firms usually experience attrition-related benefits for work in which efficiency and standardization are key considerations. In complex and judgment-intensive work, it is often desirable to have a very limited attrition. Furthermore, the benefits of attrition are relatively easier to achieve in moderate- to large-scale and growing operations. Small-scale and low growth operations need to consciously develop employee career paths to mitigate the challenges of higher people costs associated with a stagnant workforce. Business leaders and HR managers can benefit by adopting this quantitative approach to assess the impact of attrition on their operations. To gain maximum value, they should institutionalize metrics to fully estimate – ideally capture – both the costs and benefits of attrition. Business managers should also identify the level of attrition that is good for their operations, and plan for it in their annual budgeting and forecasting cycle. For more details on this topic, please refer to our recently released report, How Much Attrition is “Good” Attrition? While this is not the first instance of service provider restructuring, this time is unique because multiple firms have announced programs at essentially the same time. In addition, there is speculation that other global majors will launch business portfolio restructuring initiatives (i.e., carve-outs, leveraged buyouts). Why is this happening now? The reasons are relatively straightforward. First, many global providers have experienced reduced profitability in traditional “non-core” businesses. This, coupled with increasing competitive intensity and the shifting competitive landscape is resulting in pricing pressures. Second, next generation capabilities (e.g., social media, SaaS, analytics, and cloud) are poised to become the next growth engines, and all leading players are channelizing their investments in these areas. Finally, most global players are moving toward rationalizing their portfolios for focused investments, due to strained management bandwidth and focus. But these initiatives will create multiple impacts beyond the obvious strategic objectives. Consider this: over the last eight quarters, the operating margins of the leading global service providers (Accenture, Aon Hewitt, Convergys, CSC, HP Enterprise Services, IBM Global Services, Unisys, and Xerox Services) grew the most in Q2 2014. This restructuring trend will likely continue as some of the long-term benefits translate into improved profitability for global service providers. Improved profitability of global majors will also impact buyers and other service providers. We anticipate increasing focus by offshore-centric service providers on inorganic growth by acquisitions. They are also likely to scout for more collaboration opportunities to build capabilities, particularly in next generation global services. We also foresee buyers aggressively monitoring provider investments to evaluate sourcing model decisions (i.e., build vs. buy). Interestingly, one of the unintended after-effects of these restructurings is that the offshore-centric service providers have witnessed better revenue growth than the global majors, and thus have improved in their relative rankings by revenue. For example, TCS recently overtook CSC in terms of overall revenue. And other offshore-centric providers are also bridging the revenue gap with their global counterparts. While this ranking reshuffling has been occurring for some time, the global major’ restructuring initiatives and focus on profitability (sometimes at the expense of revenue growth) has further accelerated this trend. For more details on these restructuring initiatives and their impact on the global services industry, and other information on leading service providers, please refer to our Market Vista™ Q3 2014 report. Although GICs are an integral component of the global services market with increasing adoption by buyers, there continue to be questions about their cost competitiveness. To obtain the facts, Everest Group conducted GIC cost competitiveness assessments with both source markets (North America and Europe) and service providers. Following are the key findings from our recently released report on the topic. Despite sustainability concerns, our analysis indicates that GICs provide source markets with significant cost savings. Savings typically vary between 30 to 70 percent, across most locations and functions. More interesting is the finding related to change in cost arbitrage across successive years. In India’s case, favorable exchange rates, coupled with a less-than-anticipated impact of wage inflation, has strengthened cost arbitrage over the last two to three years. While the focus in recent years has naturally been on India, it’s important to acknowledge and remember that other leading locations, (i.e., Philippines, China, Mexico, and Poland), also continue to offer similar cost arbitrage compared to the last two to three years. The report examines the sustainability of cost savings (measured by number of years) in detail by evaluating cost inflation (separate for wages and other cost elements) and forex movements in leading locations. Exhibit 1 provides a synthesized view of our analysis, indicating the sustainability of cost arbitrage for most locations/functions even under aggressive inflation and currency movement scenarios. The sustainability analysis is based on labor arbitrage alone, and excludes the impact of efficiency-based levers such as reducing general and administrative expenses, moving to tier-2 locations, increasing capacity utilization, and increasing span of control and deskilling. While not all GICs have been able to fully leverage and exploit these levers, best-in-class GICs have been able to achieve an additional 10-12 percent savings beyond labor arbitrage. In our experience, most buyers compare GIC costs with service provider pricing to assess the relative cost difference between sourcing models. But this comparison often fails to capture the true financial impact of a sourcing decision. Mature buyers evaluate the Total Cost of Ownership (TCO) metric. In addition to hard costs (e.g., salaries, facilities, technology, and telecom), TCO incorporates the soft costs associated with transition, governance, and relationship/account management, along with net impact of productivity measures (see Exhibit 2). Conducting a TCO analysis yields interesting results. Indeed, there are instances in which GICs have significantly lower TCO costs than service providers for certain kinds of work, even though the GICs’ operating costs would be higher than provider rates. The relative cost competitiveness between sourcing models is dependent on multiple factors. There are those related specifically to the work and where/how it is delivered (e.g., relative scale, process maturity, nature of work, and domain expertise.) There are also company-specific factors driving differences, such as preferences for a more experienced pool, better pedigree talent, market positioning as an employer of choice, promotion of similar organizational culture, and approaches to gain share. To truly gauge cost competitiveness of GICs with service providers, organizations need to conduct a TCO analysis that takes into account all hard and soft costs and unique requirements. We are hosting a webinar on Thursday, November 20, that will discuss how GICs add strategic value to the parent organization and how they can quantify that value. Register here. What changes occurred within the global offshoring and outsourcing market in 2010? Last week we released our Q3 2010 Market Vista research report. Our research shows that the market continues to see steady – but unremarkable – growth since 4Q09, with increased transaction activity in each successive quarter. Amid concerns related to negative sentiment against offshoring in some markets, outsourcing transactions held steady in Q3 2010, leading to cautious optimism regarding the overall health of the industry. Many in the market want to interpret the modestly increasing overall trends as an indicator of the economic cycle. There is some truth in correlating the slow growth to the broader economic conditions, but what I find most interesting is how the underlying trends are all clearly showing signs of a more mature market and the needs of such a market at this point in time. We provide details of this quarter’s market activity in our 180-page report regarding captive set-ups and divestitures, location trends and costs in leading Asian cities and the service provider space. So, here I’ll comment on ways in which the data points to a maturing market. The most obvious illustration is the ITO market – Q3 2010 saw a larger share of renewed and restructured deals than during previous quarters, and witnessed signing of a variety of mega deals (total contract value of more than U.S. $1 billion), most of which were renewals. It is logical that renewals would start to form an increasing important part of the contract signings, but these renewals also reflect how the overall market is changing in a couple of key ways: 1) more deals are being broken up into smaller pieces and; 2) new entrants with offshore-centric delivery models are continuing to gain traction in the traditional asset-heavy IT infrastructure space. Increasing focus on building an offshore portfolio to support a broader portion of the business. As organizations optimize their internal delivery for offshore services, they realize the benefits of scale and are increasingly trying to ensure centers are leveraged by multiple business units . This trend toward specialized centers of excellence is likely to be more pronounced for manufacturing and technology companies than for other vertical industries. While a few divestitures of captives will occur, they are likely to be selective and made to optimize the global sourcing portfolio of parent organizations. From a location perspective, key offshore geographies such as India and Philippines have started to witness increasing competition for talent in recent quarters. Compared to the same period in 2009, attrition rates are up 5-10 percentage points as service providers resume hiring at meaningful volumes. From a geography perspective, activity is spreading to new markets in Africa and South-east Asia, led by the more aggressive adopters. Yes, things in the outsourcing industry are ebbing, flowing and morphing due to a variety of factors. But in comparison to last year, the size of the market has certainly grown, and in today’s challenging business environment, similar quarter-on -uarter transaction levels are all we can reasonably expect. Join us on the Market Vista Q3-2010: Key Market Developments Webinar for detailed discussion on trends in this quarter. The webinar will also feature a discussion with Atul Kunwar, President, Mahindra Satyam, on management priorities as Mahindra Satyam looks to capture growth and market share post announcement of restated financials.